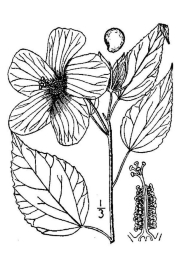 Foliage: The stems and leaves of the marsh mallow are covered with minute, dense, hairs; the leaves are three lobed. Flowering time: Flowers late July to early September; fruits late September through autumn. Range in New Jersey: Throughtout the state, very common southward along the Delaware River and the coast marshes. Misc. 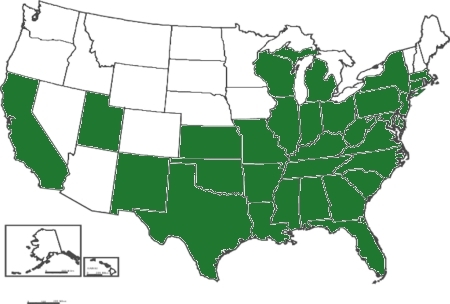 USDA lists as Obligate wetland species; i.e., occurs almost always (estimated probability 99%) under natural conditions in wetlands. "The flowering of the Mallows on the coast and river marshes is perhaps the most extensive display of color that the flora of our region presents. Throughout the month of August they form great masses of pink and white bloom, which can be seen at a long distance, and seem to be laid out over the swamps like flower beds in a garden. The flowers are either pink or white, with or without a crimson eye. Only one style occurs on any given plant, but the plants are usually mixed together indiscriminately, and show, besides differently colored flowers, considerable difference in the shape of the leaves, pods, and calyx-lobes." 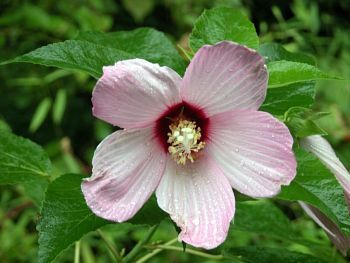 The form with all-pink flowers is sometimes classified as a separate species, Hibiscus palustris. Hibiscus, The ancient Greek and Latin name for a mallow-like plant; moscheutos, musk scented.